Symbols*: The majestic tiger commands attention and respect as it roams through the grass. It possesses a power that emanates from its fiery orange coat. The tiger is direct in its mission: it has the ability to focus its attention on whatever it desires to acquire. It dips its paw into a small, rippling pool. The pool represents creative energy. Three pentacles can be seen forming amid the ripples. The tiger has stirred up the energy contained within the pool. The tiger’s presence has generated an energy that affects the immediate environment. Everything has been set into motion by the noble beast. Description*: By focusing your attention on honing a skill, you may have the opportunity to utilize your creativity in a profitable manner. Pursuing work that has creative possibilities can lead to inspiring, self-satisfying endeavors. By perfecting your skill, you have the possibility of expanding your whole outlook on life. If you love what you do, your whole disposition may reflect this renewed enthusiasm and affect those around you in positive ways. Possible Meaning: By focusing your attention on honing a skill, you may have the opportunity to utilize your creativity in a profitable manner. Pursuing work that has creative possibilities can lead to inspiring, self-satisfying endeavors. Thoughts/Points to Ponder: She’s smiling at you, while she is taking a step into the water as if she was saying “listen to your emotions, listen to the ever flowing water, only then you will find the answers you’ve been seeking.” While this is a earth card, water is very present here. She is a healer, she helps you to focus, and with finding patience. Tiger's gift is focus, patience, and the ability to heal quickly, both physically and emotionally. Healers often have a Tiger totem. It is very important for Tiger people to have time alone in their own special place. Tiger is the symbol of darkness and the new Moon. When a Tiger totem enters your life, expect new adventures. It will awaken new passion and power. Tiger people do their best work at night. They are very sensual and passion people and devoted parents. Your best work will be done at night. 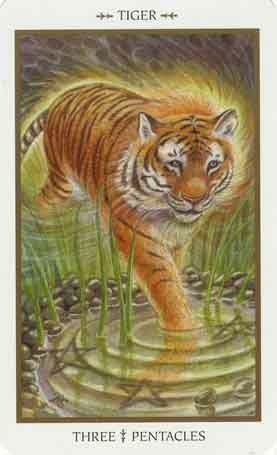 Tigers are associated with water and have all the properties of the element of Water - healing, power through gentle flow, feminine energies.